WordPress may be the best solution for your business or organization. WordPress is a flexible solution for creating a responsive website that is easy to update. Many businesses choose this option because once your site is developed and live, you can easily add and edit content yourself – ensuring that your website stays current and fresh. WordPress is the ideal choice for setting up and managing a blog as well. Originally built as a blogging platform, WordPress is a Content Management System (CMS) that boasts thousands of features, available through the placement of widgets and plugins. Setting up a WordPress site can be a bit tricky and time-consuming for the non-technical user. 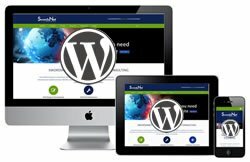 But at SwordsNet Designs, we specialize in WordPress theme customization for small to medium-sized businesses. We will give your site the unique look, feel and functionality you desire, and get you on your way to making your own updates and blog posts. Need WordPress training or someone to walk you through the basics? We can help.